Maniac Monday is what we call ‘segunda-feira’ in Mozambique and for good reason. Sunday is ‘domingo’, just as in Spanish, it represents The Lord’s Day. So as is typical of Northern Mozambique, things move a bit more slowly after everyone has been to church or mosque, and the first day back to work is really the second or ‘segunda’ day because the first was a day of rest (I deign to comment on Southernmost parts of the country as I have read enough to know there are major distinctions.) No wonder things move so slowly. Just last week on segunda-feira, I was on a bus heading toward’s the Mayoral side of the village for a special day known as Dia da Mulher Moçambicana, or, Women’s Day. Of course, the bus was approximately an hour late, but then again an hour is not so bad by African standards. The ladies were on their way to a day of festivities where we were told very little about, except that we would be playing football (soccer as it is known by Americans) at 12:00. So why was the bus scheduled at 9:00? Across several dirt roads and songs echoing throughout a sweaty, slightly uncomfortable vehicle with shouts of chorus presumably about things women did or the men they had to put up with, we travelled throughout the village. This seems to be a common denominator across cultures. Curious, isn’t it? 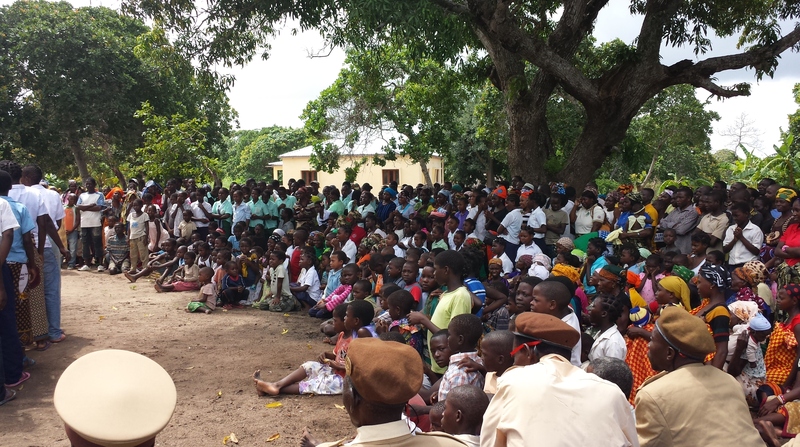 A crowd of villagers looks on, seated comfortably on grounds outside the Mayoral heart of the village in Nacala. If the reader is wondering what the shouts of WOMEN answered, it was as probably guessed already – when the men go out… Who does the work? Who is there? Women! Mulheres! Giggles ensued with each refrain. 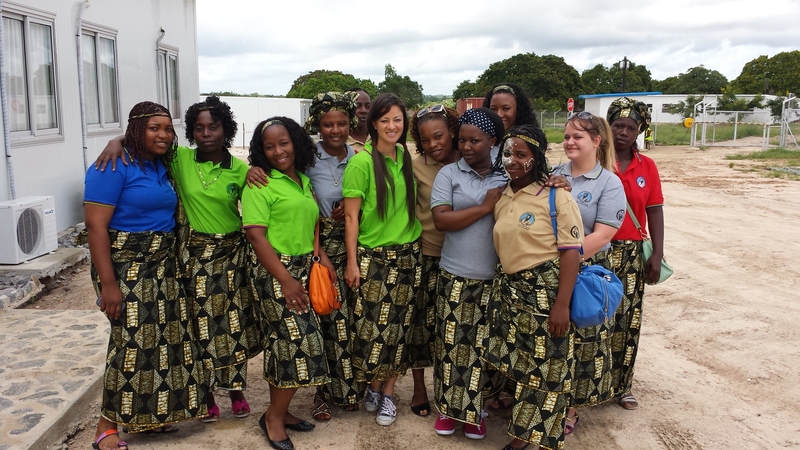 So, delightedly screaming and in perfect rhythm, the ladies clapped their way from the outside of Nacala-a-Velha to the center of the village. Getting out of the dingy, dirt-smeared bus into a bright and gorgeous day, we heard more singing from the middle of an encampment where a canopied roof held dancers who moved in a long line waving their hands like palm trees outstretched in the wind. Everyone was wearing bright colours and looming through one another’s hips and hands, like a giant weave of fabric creating patterns of gold and red, blue and yellow. Their design was a brilliancy only reflected in their long, bold skirts sashaying in the breeze. When the movement stopped, a crowd of mostly children and women sat openly under the sweltering sunlight in loud applause for a day hopefully precipitated by more performances. Instead of more dancing, however, we were subjected to two political speeches about the economic power and progress Mozambique was using to become a great nation, and the honour of such development and investment (In a not-so-ironic nod to the giant port constructed just a few kilometres away, they hailed foreign companies as brilliance incarnate.) as brought by the premier political governance of Frelimo. While the speech was meant to be empowering for all, there was a decidedly conspicuous lack of discussion about women. While my lack of linguistic prowess is decided, the simple word ‘mulher’ was so rarely used, I almost dare to say I heard it once. Coincidental? Frelimo was certainly a party to the conversation, but what about the female? Where was she? See Democratic Republic of Congo’s response to women below. Inciting! He could not truly answer, except to insist the same elements of the great work of the female he had managed to state before. This was not entirely satisfactory as I had observed time and again how hard the women worked – was this not the time to recognize how much the female contributed year after year to producing such efficiency, progress and success? It seemed too often a familiar story – a woman is an object of beauty and designed to contribute to family. While not denying these elements of the female are still part of her makeup as a human being, (In fact, the human race certainly would not have progressed as far as it has today without such attractions) what about her contributions outside of the aesthetic and motherly role? Captured in a sea of lovely Moçambicanas and a few South Africans. As far as career and hard work, I had seen much to make me proud of women. My limited experiences with waking early in the day and driving down any main road shows the female outnumbers the male at least 10 to 1 carrying anything one can think of on their heads from mattresses to timber. While this might be a subject often discussed on this website, it is one I will not tire of easily until I’m proven wrong and women are recognized for their work. The crowd erupted in a volcanic burst of laughter. I certainly hope someone got the real joke. Feliz segunda-feira.